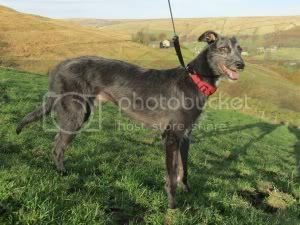 West Yorkshire Dog Rescue have a homecheck process, adoption contract, donation required, returns policy, ensure all dogs are neutered. boisterous dogs and will growl but is relaxed and happy with steady dogs. he stands about 26 inches at the shoulder. 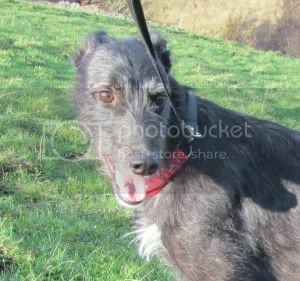 He needs a lurcher-experienced home please. Jimmy has damage to the ligaments in his leg. Jimmy is fed either Salmon and Potato or Lamb and Rice complete biscuit, he gets tuna and salmon mixed in to give him the Omega oils so has really good skin and coat condition. He is fed Glucosamine tablets for his leg. This really is a super dog, a great companion and pet. Jimmy is very affectionate with everyone he meets, he is kind and gentle and an easy pet. He has been a very patient boy through all his treatment and has accepted with good grace the fact he has to have a lot of crate rest to protect his leg whilst it is healing. He doesn't suffer from separation anxiety if he has a kind gentle dog as a comapnion, he doesn't bark or howl, and he is house trained. Jimmy enjoys rides in the car. He is an easy dog to live with and a stunningly handsome chap. Management of this dog. The vet has advised that Jimmy is never let off the lead. It would be beneficial to continue with Glucosamine tablets available from health food stores or vets, they are not expensive but will support the joint. When being walked around urban streets he must be muzzled in case he ever came across a cat because he would kill it. The muzzle could be removed if he was in an open space, but again, he must never let off lead. Because of this door control is essential he needs a home with responsible adults who will always keep outside doors shut. In the garden he cannot be left alone unattended if there is any possibility he could try and climb over the fence as that would re-break his leg so s garden fence of 8 foot would be needed before he could roam free. Also he could kill a cat entering the garden. It is not necessary to continually crate Jimmy but if a crate needs to be used that is OK as long as it is a minimum of 48 inches so a big house is needed. He has been on enforced crate rest whilst he has been healing so is very relaxed and happy as long as the crate is sufficiently large to accommodate him stretching right out which is essential as he must not be forced into a small crate which would continually flex his bad leg. We are looking for a lurcher experienced home with mature adults who can ensure he never escapes, is kept on the lead, and has a kind similar type of dog as a companion. We are looking for someone who can give him 5 short walks a day and if there is a garden that is securely fenced to 8 foot. Neutered, vaccinated, treated for fleas and worms, microchipped. He has had a full dental clean and polish with necessary extractions of the bed teeth. Last Edit: 7 years 2 months ago by kathytrout. Reason: additional information about Jimmy needing a dog as a companion when his owners are out.